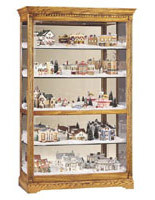 This Trophy Case for Collectibles is Designed by Howard Miller! This Showcase Features Lighting and Locks! 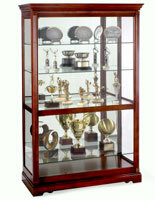 A wooden trophy case by Howard Miller is an elegant investment for a family. 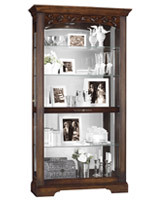 The wooden cabinets are produced from the finest, hand-chosen hardwoods and veneers. 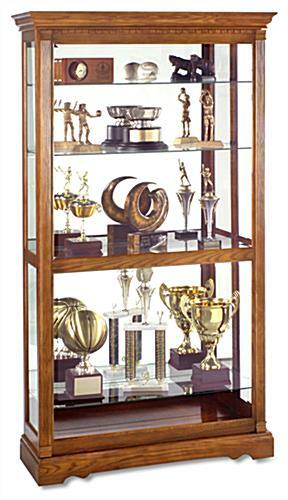 Purchasing a wooden trophy case from the Howard Miller collection means you are buying a first rate piece of furniture, made so well and produced from such fine substrates it is certain to be passed down from generation to generation as a family heirloom. 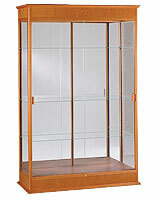 This wooden case weighs 204 lbs, and ships FREIGHT. 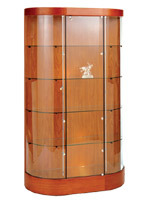 A side-to-side sliding, locking door to ensure the safety of your valuables. 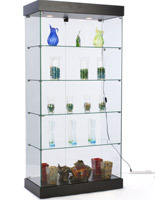 Four adjustable glass shelves to allow versatility in the height of items. 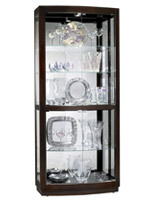 Halogen lights for a brighter, whiter, more natural way to showcase your items. A No-Reach™ Touch-Lite™ with four lighting settings to provide easy access to lighting changes. 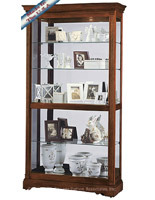 Plate groves to ensure the safety of dishware and other vertically oriented collectibles.